Our epoxy countertops have the look and feel of polished natural stone. They are 100% non porous and never need to be re-sealed. Epoxy countertops are an exceptional solid surface for food prep which does not promote the growth of bacteria. Our countertops are custom manufactured. Our unique coloring process allows for any color combination. We’re not limited by stone availability, slab size, or even large price increases for the look of exotic stone. Veins and other mineral effects found in natural stone can be mimicked or even enhanced to complement any kitchen layout, allowing for a versatile and dynamic element to any design. If we are custom making your new countertops off site it can be installed in as little as one or two days. Home owners won’t be without a kitchen for weeks at a time. However, the beauty of this product is we can go right over your existing countertop surface, eliminating the need of removing you existing tops, which means no dust and debris generated by removing your existing tops. Our countertops have a very durable surface and is scratch and heat resistant. 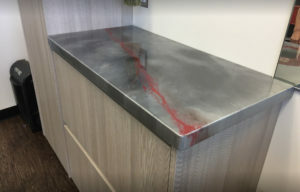 As with all countertop surfaces, it’s possible to damage the epoxy, however our process makes those small repairs simple. When other countertop materials are damaged they are hard to fix and sometimes even un-repairable. Our epoxy countertops are environmentally friendly. Our epoxy contains very low VOC (volatile organic compound, qualifying as a green building material).